Architectural PU Fluted Columns remind us of the ancient world and if you want to add a hint of this to your project, Architectural PU Fluted Columns have fluted and plain designs,half and Full Columns with caps and bases to creat to suit your project. In order to support the weight,You may put steel pilaster in the middle of Polyurethane Columns,PU Columns can be drawed and pacinted with your interested colors. 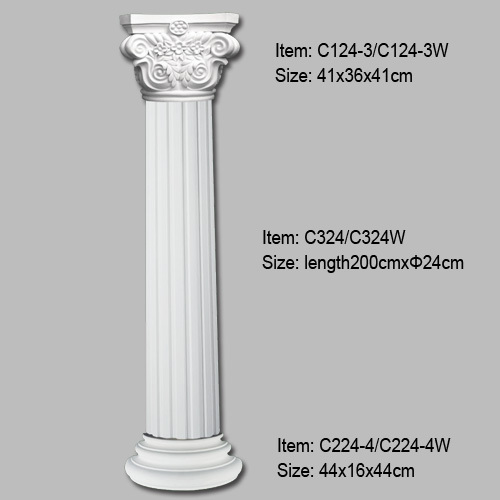 We manufacture Polyurethane Columns , Decorative Columns , Porch Columns , Architectural Columns , Polyurethane Corbels , polyurethane half Columns , welcome to your enquiry!